Between 2008 and 2015, the United States was able to reduce carbon emissions while enjoying limited economic growth. Earlier this year in Science, President Barack Obama pointed to this data as evidence of "the irreversible momentum of clean energy" (10.1126/science.aam6284). But in a commentary published September 6 in the journal Joule, John Deutch, who has worked with the energy departments of several presidential administrations, urges cautious optimism. He explains the country experienced a short-term decoupling of emissions and economic growth that models suggest won't sustain in the future or be enough to prevent climate change. "My article says that the reason that happened is two-fold: first, the economic growth was really quite modest during that period; and second, there was an unusual shift in the carbon intensity–carbon per unit of energy used by the US economy–because of the unusual shift during that period from coal electricity generation and natural-gas electricity generation," says Deutch, an emeritus professor of chemistry at the Massachusetts Institute of Technology. "So there was a shift in carbon intensity that was responsible for the favorable experience the country had, but it relied on that one-time shift and on the fact the energy growth was more limited." This calls into question whether, in a business-as-usual scenario, the United States can continue to lower carbon emissions at its current pace while also growing the economy. Deutch points to an industry standard mathematical model that relates human economic activity to carbon dioxide emissions, called the Kaya Identity, which predicts that maintaining a 2% annual economic growth in the United States would require producing carbon dioxide emissions significantly beyond the current ambitious 2050 targets. Other countries, such as China, face a problem in which their pledges to reduce emissions would mean not meeting certain economic goals. 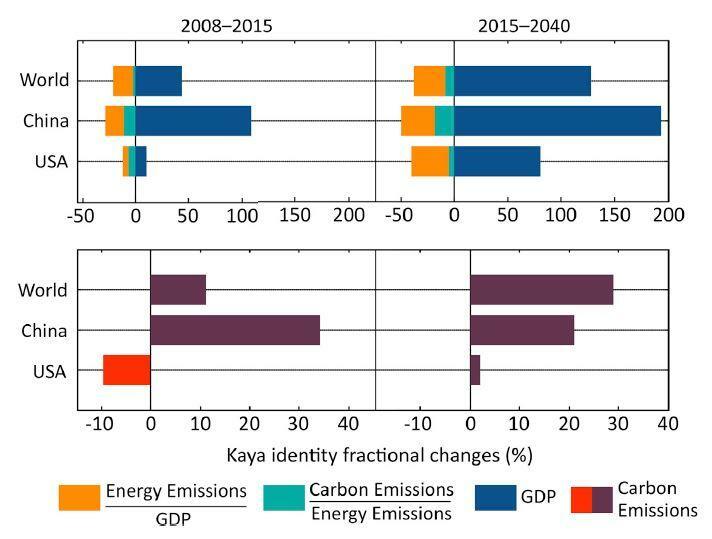 "If you properly consider the relationship between economic growth and carbon emission with respect to the Kaya Identity, you have a much different view of what the likely projections are over the next 25 years, and in fact, the Department of Energy and the US Energy Information Administration does not project a significant decline in carbon emissions in the United States or worldwide," Deutch says. "I very much support the Obama administration efforts on energy and climate, but I think it's important to understand the basis of projections, convictions, and beliefs based on analysis rather than just fragmenting information from one period." In the Joule commentary, Deutch writes that planned reductions in energy use and carbon intensity are welcome and likely irreversible, but the reductions as currently planned will not be enough to avoid the oncoming impact of climate change. Some of the remaining options are for policies to change, for technology to rapidly improve so energy is used more efficiently to power a country's economic activity, or for investment in how the world can adapt to climate change.